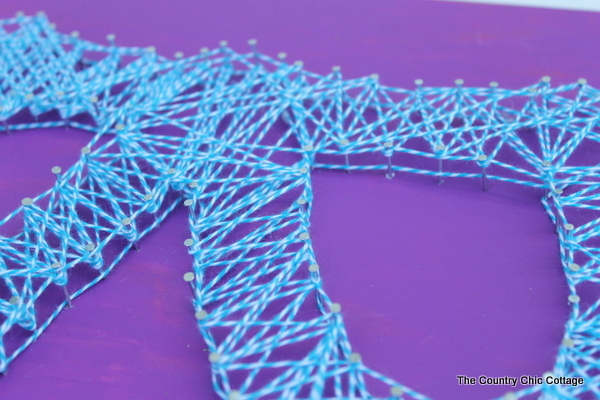 I have a fun kids craft for you today with my DIY string art. 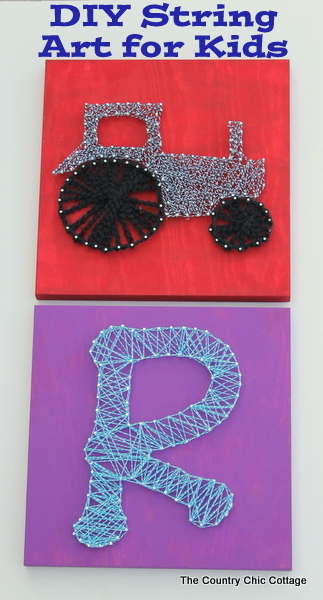 Bring string art back in a fun and imaginative way that the kids will love. They can pick any design they desire and you can have some quiet time as they wind string around the nails. My children are older so they did almost the entire project themselves with just a little supervision. Younger kids might require a bit more hands on to finish this project. This project was originally posted over at Crafts Unleashed but I wanted to post here in case y’all missed it. 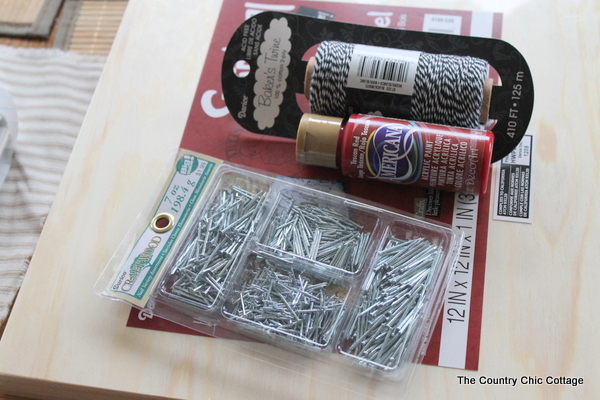 Portions of the below supplies were given to me as part of my design team status with Consumer Crafts. All projects and opinions are my own however. Choose your image and size it to fit a standard sheet of printer paper. Print out your image. In the meantime, have your kids paint the board in the color of their choice. 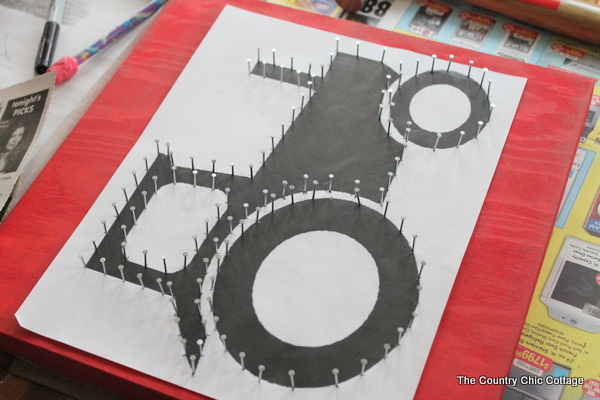 After the board is completely dry, add the paper to the board, making sure it is centered and straight. Add two nails around the edge of your image and through the paper to hold into place. Be sure to use nails with a large head. Do NOT put the nail all the way into the board. The nails should stick up so you can wrap the string around them. Use a pencil to mark approximately every 1/2 inch all the way around your image. Older kids can now take over and nail on every pencil mark. Again, make sure they are using nails with heads and that they make sure all of the nails are poking out of the board at around the same height. 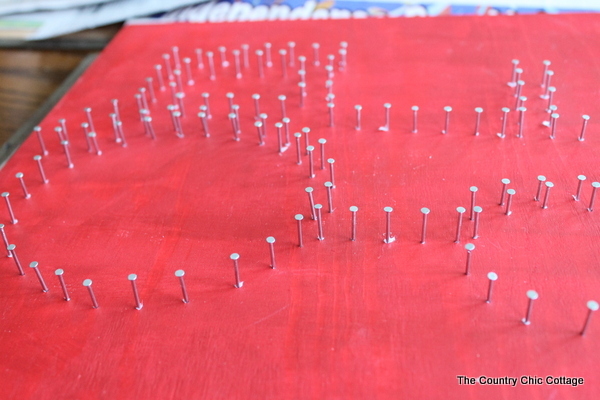 When you are finished inserting the nails, it will look like the picture below. If you have younger children, please do the nailing for them and allow them to work on the string in just a minute. NOTE: We decided not to add nails to the inside of the tires on this image. My son did all of this nailing himself and was so proud. Yes, there are some that look crooked. In the final product it really does not matter so just go with it. 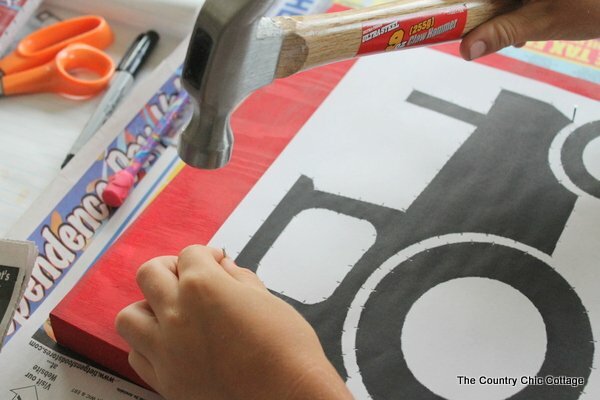 Kids crafts are full of imperfections so resist your urge to correct. You can now rip away the paper from the board. You are left with a sea of nails and the kids are ready to wrap some string. Young and old alike will love adding string around the nails. In and out, around, zig zag, any combination they can come up with! Start on any nail and knot your string. Then work it around until you are happy and knot it off on your last nail as well. Make sure to keep the string taught in order to get the proper results. 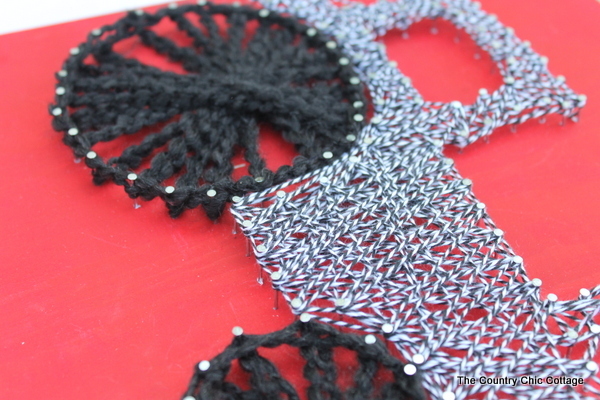 Be sure to add string around the edge as well as in the center. See the tire above and below and what a difference this makes. Your budding artist can use as much or as little string as they would like. The tractor got a healthy dose of baker’s twine. The initial my daughter completely got a little less string but the results are amazing just the same. Each finished product is a reflection of the child and their personality. 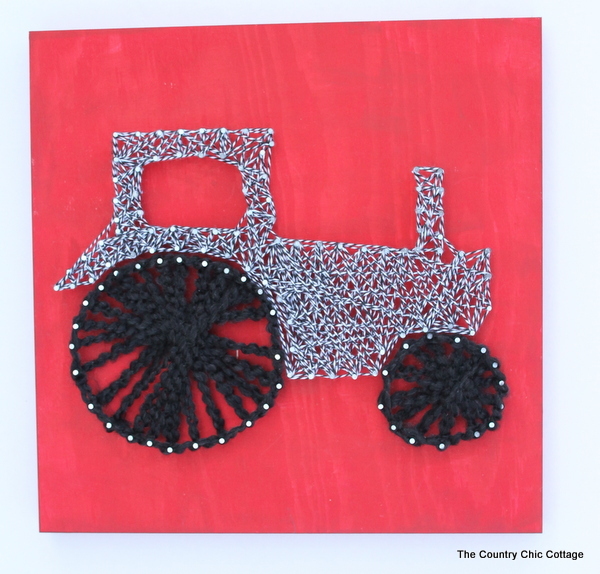 This is one kids craft that you don’t have to hide in the closet. These look great displayed in their rooms. 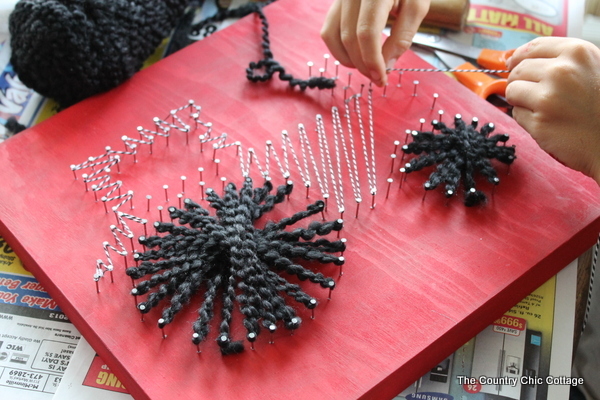 Grab some nails and string and get started on your own version with your kids. What a great project to complete while snowed in! What design will your child decide to tackle? Let them choose the design and colors to make a creation that is all their own. 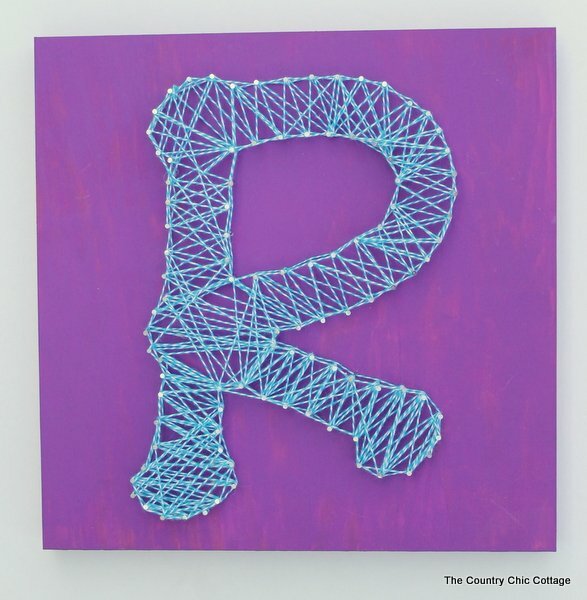 My kids craft DIY string art is the perfect craft for children to be proud of.